Thanks to its extraordinary collections of paintings and ancient statues, the Uffizi is one of the most famous museums in the world. It exhibits artistic masterpieces by Giotto, Simone Martini, Piero della Francesca, Filippo Lippi, Botticelli, Mantegna, Correggio, Leonardo da Vinci, Raphael, Michelangelo and Caravaggio. German, Dutch and Flemish masters are also well represented with important works by Dürer, Rembrandt and Rubens. 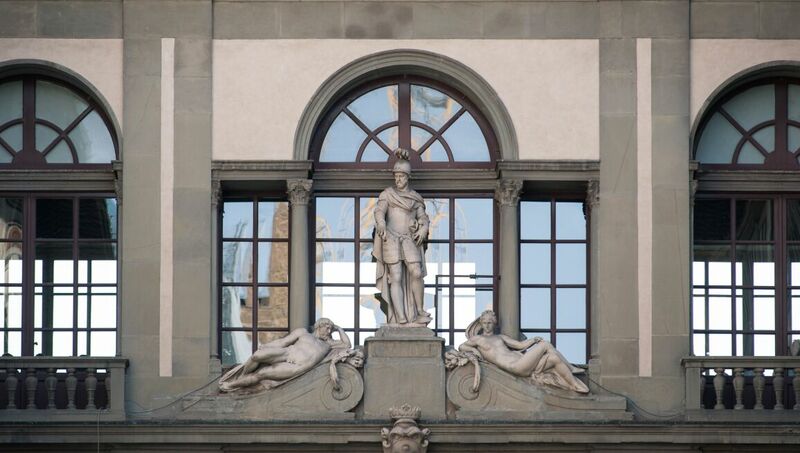 The Uffizi Gallery occupies the top floor of a large building erected by Giorgio Vasari between 1560 and 1580 to house the administrative offices of the Tuscan State. The Gallery was created by Grand-Duke Francesco I and was subsequently enriched by various members of the Medici family, who were great collectors of paintings, sculpture and other works of art. The collection was later rearranged and enlarged by the Lorraine Grand-Dukes, who succeeded the Medici, and finally, by the Italian State. oil on wood, 90 x 222 cm.